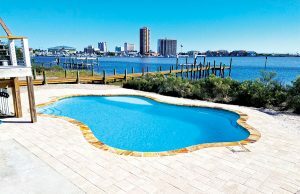 In Walton County—including Freeport, Santa Rosa Beach, and Defuniak Springs—and in the surrounding region—such as Crestview, Destin, and Niceville—our team of pool design specialists and construction crews can build your new, state-of-the-art oasis or bring new life to your aging pool with a complete renovation. Our expertise spans the full range of inground pool construction options and pool designs. 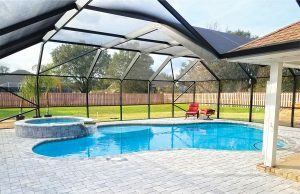 Starting with the kind of custom shape and size you would like, we can build you a simple pool for cooling down in the Emerald Coast heat, an ornate aquatic masterpiece, or anything in between. After all, with the design and configuration versatility that a gunite pool provides, we can make your backyard resort especially appealing with a range of decorative options. Coupled with features that make your pool more attractive is our advanced technology, called SmartFeatures. They help make your pool easier to maintain, more economical to operate, and more comfortable to swim. For example, we offer alternative purification systems that use gentle ozone and ultraviolet sanitation, so you can slash chemical use in your inground pool. You can also select a remote automation system—even a smartphone app—to run your pool and spa. Our filters contain antimicrobial product protection and require minimal upkeep. And our variable-speed pumps are energy-efficient and comply with Florida swimming pool regulations. Owned and operated by our family, our Blue Haven operation delivers exceptional commitment that comes through with every inground pool that we build. But don’t believe us; see what our clients have to say about our custom pools. Look at our online reviews: We average a 4.9 (out of a possible five stars) on Facebook—with many, many pool clients expressing their high degree of satisfaction. That level of client satisfaction does not come from luck: It comes from our extensive experience and the deep expertise our team possesses. 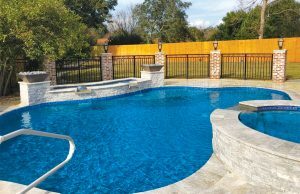 For starters, we’ve built more than 2,000 backyard pools for Gulf Coast homeowners and, we are ranked #1 in pool construction volume for the last three years among Northwest Florida inground pool builders. 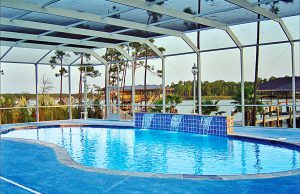 We are a certified, licensed Florida pool contractor, and we carry complete insurance and bonding. On top of that, we’re an accredited, A+-rated BBB member and a member of the Home Builders Association of West Florida. As members of the Association of Pool & Spa Professionals, we stay up on industry news and standards. And our owner serves on the National Plasterer Council’s board of directors. So when you’re ready to begin planning your new aquatic retreat, call our pool professionals for a free in-home estimate. We will send a designer to home to measure and evaluate your backyard space, discuss your budget, review the kind of pool design you want, and present the technology features that can go it. Above all, your designer will pay attention to any requests you have so we build you a pool that looks and functions how you and your family want it to. We also offer financing (oac) through our network of lenders, and we accept major credit cards for certain payment phases on your new pool or remodel. The Blue Haven Pools & Spas trademark has been in use since 1954. Some offices may be independently owned & operated and have been in business for varying numbers of years. Check with your local licensing board or state corporation division.